Who is developing The SL Viewer 1 with Mesh Support ? “SSE2, Streaming SIMD Extensions 2, is one of the Intel SIMD (Single Instruction, Multiple Data) processor supplementary instruction sets first introduced by Intel with the initial version of the Pentium 4 in 2001. It extends the earlier SSE instruction set, and is intended to fully supplant MMX. Intel extended SSE2 to create SSE3 in 2004. SSE2 added 144 new instructions to SSE, which has 70 instructions. Rival chip-maker AMD added support for SSE2 with the introduction of their Opteron and Athlon 64 ranges of AMD64 64-bit CPUs in 2003. For those who cannot understand what this means, I will try to explain in a human tongue and not on a computer tongue, SSE2 is a kind of new language which will just replaces an old one (MMX). This New language (SSE2) just have better things and have some changes than the old language (MMX) cannot do it. So SSE give a new set things to the brain (CPU) to improve it works and make it faster. The only problem is that this language (SSE2) cannot be included on an old processor or an old processor cannot be upgraded to have it. Why?, because SSE2 is included internally on the CPU and it is not a separate hardware that you can buy on a computer store. Again using human tongue, this means that new brains comes with the SSE2 inside of them and cannot be bought separately. It is possible that the SSE2 are included on computers with Pentium 4 Processor (as is says in wikipedia) but it is better that you check with your tech support about this, before to install a SL viewer V1 with mesh support. It looks like that two different developers from different programs just created each one a version of V1 with support of Mesh. I am not comparing or saying who did first, It is just wonderful that some developers and some programmers put so much interest in their projects and to port one technology into another program. 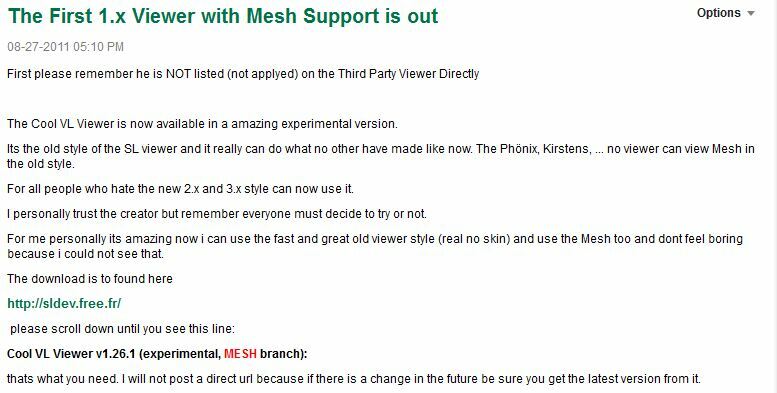 Adding mesh to a V1 viewer is amazing and many people that don’t want to use most recent versions of SL Viewer (Like 2 or 3) can be benefited from this. I have to recognize that this hard work will be useful for the future development of Phoenix. For the developer of CoolViewer and for the developers of Singularity I would like to tell them my infintive thanks!. In another post, I will try to test both viewers and see their performance on my machine, but anyway wait until the final version! that may be come in the following weeks. This entry was posted in Old Post on November 1, 2011 by Xpontaneus.